A curious and open mind is truly one of the most incredible gifts a person can give themselves. The desire to forever absorb knowledge, to be open to the new and the odd, the beautiful and the brazen is to add a profound depth to life the likes of which no amount of riches could ever begin to compare. Throughout all of human history there have been countless examples of those who opened themselves up to the wonders of approaching life with a curious mind, often to benefit from the repercussions of such a choice. From the first brave souls who said the world wasn’t flat (and those who went on to prove it) to every person who has ever left their own homeland in search of a different, perhaps better life elsewhere, curiosity has shaped and often dictated the course of human evolution. Yet, one does not have to discover new lands or make profound scientific finds to embrace curiosity. All you must do is always be ready to ask “why”, welcome learning, and remain open to possibility. You have, as usual done such an awesome job with the captions to these lovely photos! You are such a gifted storyteller...it is like opening a book and taking a peek into the lives of these wonderful photos! ...happy to get a chance to catch up on some blog reading. I have an award (aka bloghug) for you at my place. I do appreciate you, dear friend, and thank you for coming by and for all your past comments! These shots are just so fun. I love the kitten shot (and that dude is hairy!) lol. The portrait from the 30's is amazing! I love the shots of all the girl friends. Remaining open to possibility...perfectly put! Once again, you've found some magnificent snapshots, dear! PS I was totally obsessed with looking through Joey Harrison's photos of his parents (the fella with the kittens) a little while ago. I felt kind of creepy. I just couldn't believe two people so gorgeous actually existed. Haha. Adorably fun snapshots today. Have a wonderful weekend! Oh what a beautiful line-up. Oh how I love these photos.. funny about the girls showing their legs.. not much lift on those skirts.. how different a time that was. I love your choices for today and think you have a great eye for finding exactly what you want! Hey there. Happy Sunday to you. I hope you've been enjoying the weekend. Take care. Good luck with the week ahead. Cheers! Wow, there are some really lovely photos there! Thanks! What a lovely collection, yet again! I love seeing old images of London, they remind me of all the fun I use to have when we use to get dragged around the art galleries for art class! Fun times! Hope you had a lovely weekend, doll! That...is a lot of chest hair! And I love the teenage "chorus girls" - so sweet! Back when teenagers could be a little cheeky without being slutty. It's adorable in its innocence. What a beautiful post!! LOVE, LOVE, LOVE looking back. Great collection of photos. Love the Picadilly Circus one. Been there dozens of times, always so exciting! 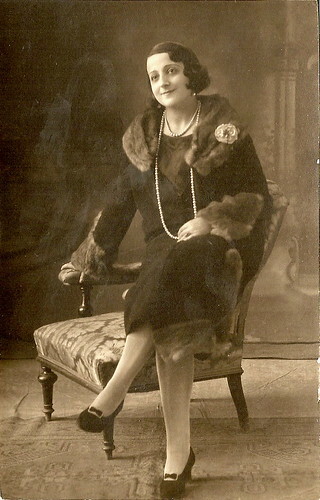 I am completely enchanted with your vintage photos! I collect them as well and, from time to time, post a few! They offer such great inspiration for thought! Love this post! Good morning, my wonderful dears! Thank you each deeply for your beautiful comments. It is a joy to read your thoughts on these timelessly classic snapshots, and appreciate each one of your visits so much!!! The London postcard picture is absolutely fantastic. I'm going to keep it on my desktop. Things have changed so much since it was taken! @ July Stars, thank you so much for your wonderful comment. It warms my heart to know that you enjoyed that particular vintage snapshot so much!